Today's offshore trip was cancelled due to all the winds we have had lately so I took Buz Ketcham from Seattle, Washington/Bolivia, NC and Duane Dunning from Gold Canyon, AZ on a backwater trip this evening. We hit several spots this evening and finally got Buz his first ever flounder that hit the scales at 7 pounds and then he got his first ever Red Drum at 28 inches that we had to release due to being over the slot limit. 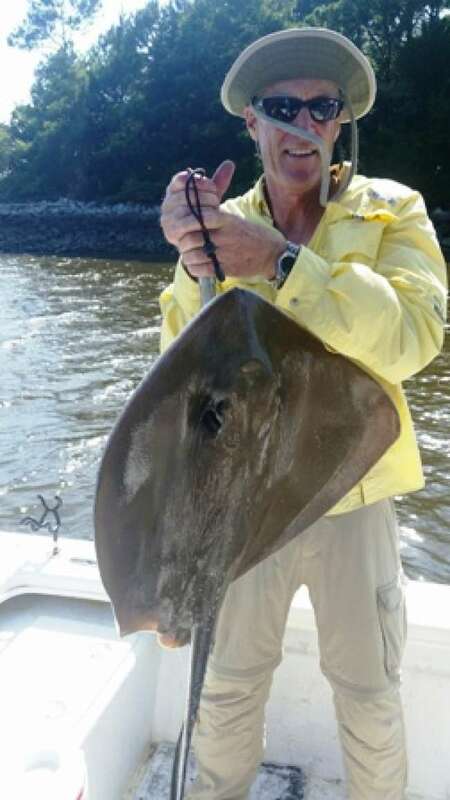 Just as we were about to head back to South Harbour Marina to get the fish cleaned for dinner Duane's rod doubled over and we thought it was a good Red Drum but ended up being a nice ray. Still quite a fight on the light tackle. Betts Flounder Fanatic,s and Pro-Cure Mullet Super Gel was the trick today!!! Thanks guys for fishing with Yeah Right Charters we appreciate each and every one of you!!!!! !